In 2006, the economist Sir Nicholas Stern produced the Stern Review on the Economics of Climate Change to weigh the cost of climate change if we do nothing to avert climate change, and the cost of averting climate change. The Stern Review concluded that the business-as-usual, or “do nothing” approach costs humanity 5% of GDP annually, conservatively. The “do nothing” approach could cost humanity as much as 10% of GDP annually. Comparatively, halting of climate change costs humanity about 2% of GDP annually. 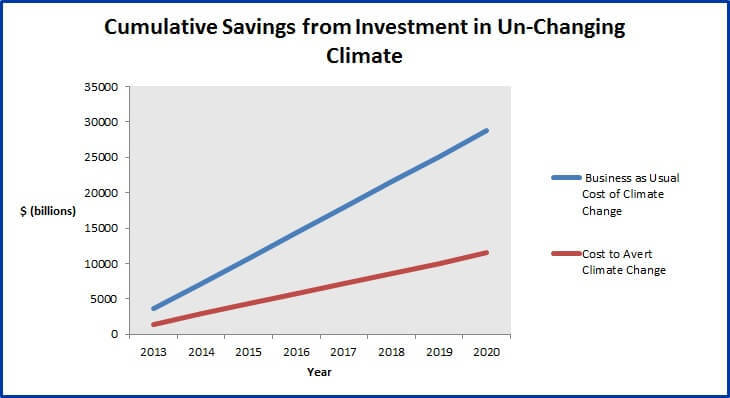 Simply put, halting climate change is a sound investment.